The operating system boots in less than a minute. It’s based on the popular PCLinuxOS operating system, but it’s optimized to run on netbooks. 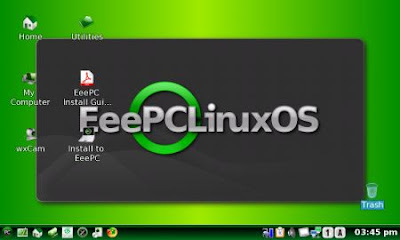 EeePCLInuxOS is also easy to install on netbooks since you can load the operating system onto a USB flash drive to install it. a whole minute to boot it up? no, I don’t think it’s for me. I won’t install any OS that takes longer than the 25-30secs it takes the default Xandros to start up. For me, the fast boot times is what the EEE is all about. Anything so mobile (by weight) and so immobile (by its meagre 3hr battery life) has to switch on and off in a blink of an eye. A minute is too long for that.